To accommodate super-wide vehicles on a 9,000-lb. capacity four-post lift, choose the HD-9SW. 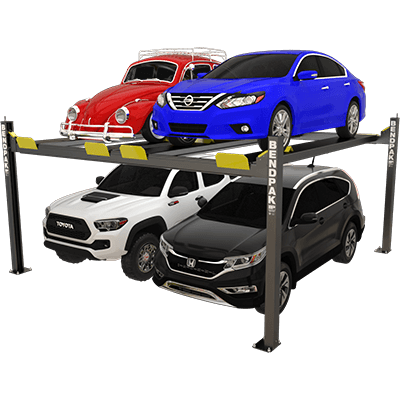 The “SW” stands for super-wide, and it’s the ideal four-post lift to double your parking and/or service wider vehicles. Single-hub cable sheaves represent the cost-cutting way to make a car lift. Not our way. BendPak double-hub sheaves reduce friction against the cables while also extending the life of the lift axles. Four lifting cables help ensure a level rise. Each is constructed from high-grade stainless steel and rated to handle 14,000 lbs. Combined, the four cables can hold 640% more than this four post lift’s rated capacity. Of course, the cables are tucked away into the lift structure. This streamlines the lift design and maintains the sleek look of your shop. It also protects the cables from environmental damage, spills, etc. 10" x 12" base plates can be bolted down or left unbolted for use with the caster kit. We encourage you to work in a way that’s best for you. The runways on this BendPak four-post lift rise just 4.5" off the ground. Add the gently inclining ramps, and you can lift virtually anything.